When you build electronic projects, one of the first thing you need is a power supply. I have a number of pages on this site dedicated to power supply design (Ref 1). You probably have a number of power supplies in your house, like wall-warts or more sophisticated bench models. I am a ham radio operator, and like other hams, I have a number of radios and other equipment that operates from 12V, so I have a number of 12V power supplies around. It is easy to assume power supplies work, but they do not always work as well as you think, or even as well as you need. A simple way to test a power supply is to attach a load to it. In the past, I have used light bulbs to load power supplies designed for 12V and lower voltage operation. However, this is not very convenient, as there is a finite choice of readily available light bulbs, and the current drawn by a light bulb varies greatly with the applied voltage, so it is not always easy to extrapolate the measurements to other conditions. Also, light bulbs do not allow to measure the dynamic response, i.e. how the output voltage changes when the load current changes rapidly. Here I will describe a simple power supply tester, called a Dynamic Load. A Dynamic Load allows you to subject your power supply to a variety of load conditions so that you can observe its behavior. For instance, you can use it to verify the voltage regulation of a power supply, i.e. how much does the output voltage change when the load current changes from min to max and anywhere in between. You can also simulate dynamic conditions, for instance simulating the load of an audio amplifier or a ham radio transmitter operating on Single Side Band or in CW (Morse code). This load can be adjusted for either constant current or constant voltage operation, and includes an oscillator to pulse the load current between 0 and a preselected value at an adjustable rate. The complexity may be a little overwhelming at first, so to explain operation, I have broken down the schematic into simple models. Let's say potentiometer R1 is adjusted so that the voltage on the wiper is 1V. Let's say resistor R2 in the source of the MOSFET Q1 is 1 ohm, and let's say that a 12V power supply is connected between the output terminals (+ on Q1's drain, the upper terminal, and - on the return). 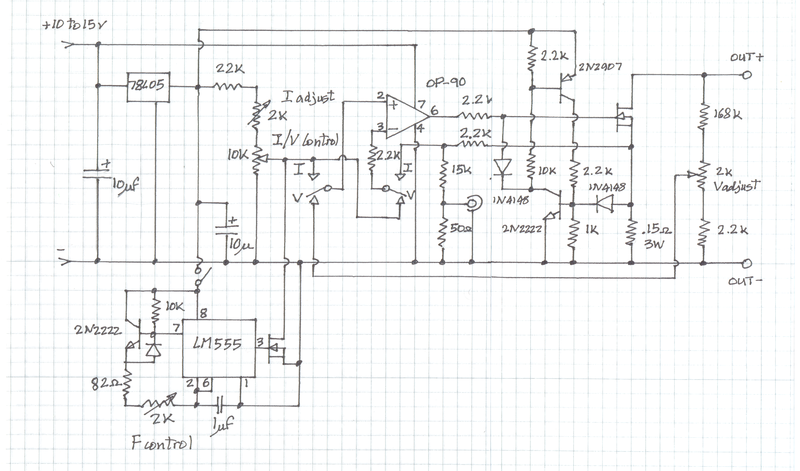 Let's assume that the operational amplifier U1 and the voltage reference are powered (supply circuit not shown). Before the power supply under test is turned on, U1 has 1V on the non-inverting input and 0V on the inverting input, so the output of U1 will go to the positive rail and the MOSFET Q1 will be fully turned on (have a very low resistance). When the power supply under test is turned on, current will start flowing through Q1, and when the current reaches 1A, the voltage across R2 will equal the voltage on the wiper of R1 and the op-amp's output will start coming down. As U1's output comes down, Q1 will be progressively less turned on and will present a progressively greater resistance to the passage of current, up to the point where the current drawn has dropped and the voltage across R2 has stabilized to a value equal to the voltage on the wiper of R1. So, there will be 1V across R2 and 11V across Q1 (source to drain), if the power supply under test maintains 12V output voltage. If the voltage from the test power supply changes from 12V down to 11V or less, op-amp U1 will change it's output voltage so that the voltage across R2 is always equal to the voltage on R1's wiper, as long as Q1 is not either totally turned on or totally turned off. Please note that under these conditions, Q1 will dissipate 11W (11V @ 1A) and will need a serious heat sink, even for short term operation. R2 will dissipate 1W and will need to be a power type, preferably wire-wound. Here is the schematic of the Dynamic Load, configured for constant voltage mode. The Constant Voltage mode is less useful to test power supplies, but it can be useful to check battery chargers. While being charged, batteries present a roughly constant voltage load, the voltage increases as the battery charges. A particular battery chemistry has a specific response voltage versus current versus time, and unfortunately many cheap battery chargers that are not designed for a particular battery type do not follow these rules very well and may damage a battery by overcharging. The constant voltage mode can be useful to characterise a battery charger for a particluar application. A Constant Voltage Dynamic Load is useful to characterize the battery charger, to monitor the charging current as a function of the battery voltage. In the Constant Voltage mode, the Dynamic Load does not have current limit, so you must be careful as it is easy to overload a power supply in that mode. make sure not to use the Constant Voltage Mode. and would damage the Dynamic Load immediately. The modulator is an astable oscillator using a 555 timer which generates roughly 50% duty cycle over a frequency range from a few Hz to a few 100 Hz. The square wave output drives a small MOSFET which periodically shorts the reference voltage from the Voltage/Current Adjust potentiometer, creating a square current pulse load adjustable in frequency. This is a fairly severe test of power supply stability and if the power supply under test operates through the entire range of frequency at its maximum current rating without over or under shooting, it can be deemed ready for service. The modulator is turned off when the Frequency Adjust potentiometer is turned all the way to the left, in which case the Dynamic Load operates at fixed current (or voltage). Please note that the modulator is not useful when the load is configured for voltage mode, unless you want to do some wild experiment. The circuit around the PNP and NPN transistors form a latch implementing an over-current protection circuit. This is mostly useful when the load is in voltage mode, since in Current Mode, the maximum current is automatically limited to the value set by the potentiometer. When the current exceeds approximately 8A, the NPN transistor turns on, its collector current increases and creates base current for the PNP transistor, which turns on also. The collector current from the PNP transistors keeps the NPN on and reciprocally, keeping the gate drive to the power MOSFET below 1V, so that the MOSFET is turned off and the current through the Dynamic Load is interrupted. This type of latch is sometimes called a "binistor". The two transistors will remain on as long as the 12V auxilliary voltage is applied. To reset the latch, you need to turn off, then back on the auxilliary 12V supply. The schematic shows a circuit using a coaxial connector and 2 resistors, 50 ohm and a 15k. The connector is used to inject a signal from a function generator in the regulation circuit of the load to create specific current waveforms more complex than what can be created with the 555. The 50 ohm and 15k resistors provide termination to the generator and convenient scaling. You do not need to build this circuit if you don't feel you will need it. If you only want a Constant Current, or Dynamic Current Load, you do not need the switch, the voltage divider on the output and the over current latch around the PNP and NPN transistors. The real value of the Modulator can be achieved if you have an oscilloscope. If you don't, the load can still be very useful to check static regulation with a voltmeter, but you may want to pass on the modulator. You can always add it later. The schematic above is for a load I use to troubleshoot and repair power supplies. I load it routinely up to 6 or 7 A at up to 14V, and I have used it to troubleshoot a 60V/2A power supply. It will go to much higher voltages, depending on the rating of Q1. The power MOSFET is installed on an extruded aluminum heat sink, and when I run the load at high current for a while, the MOSFET gets very hot and a small fan on the heat sink is useful. I use the fan out of a defunct PC power supply, which runs on the same 12V as the rest of the circuitry. Most parts are not critical. The operational amplifier can be any "single supply" type, such as a single device in an LM324 package for instance. The 5V reference is an inexpensive 5V voltage regulator in TO-92 package, any 5V regulator will work. One more critical part is the Power MOSFET. I used a power IGBT instead, rated 50A at 600V simply because it was available. Make sure you take a part with generous voltage, current and power dissipation rating, as it will get hot if you do prolonged testing. For the Voltage/Current Control potentiometer, I used a 10 turns type with a counting dial. Once calibrated, it allows to set the current (or voltage) precisely without having to use the voltmeter or ammeter each time. The source resistor (0.15 ohm/3W) is also more critical. The value can vary, depending on what you have available, but keep in mind that a higher value will limit the maximum current you can set, and the higher the resistor value, the higher the power dissipation and therefore the required power rating for a given current. My load was built using the "ugly", or "dead bug" style, and that's the reason there is no picture :-) Be creative, it is not too critical. Have fun if you build it.